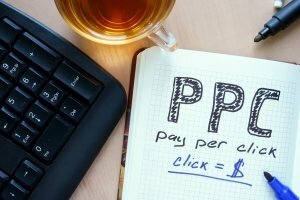 How To Determine A PPC Advertising Budget? For NEW advertisers it can challenging to set up a pay per click (PPC) advertising campaign, not to mention determine a beginning budget. There’s certainly a learning curve and, while there are reliable methods PPC is a dynamic bidding marketplace with no simple or exact way to determine the perfect launch budget. In order to get started there’s some risk. we’re going to need to commit, test and measure! What To Include In Our PPC Budget? Defining spend includes more than fees paid out to the PPC platform provider (i.e. Google). In addition to the actual cost of the clicks, let’s also assume that short of doing creative work ourselves we will need to set aside budget for 1) daily PPC platform management PLUS ( if needed ) 2) any creative ad and landing page design work. How Much Should We Bid On A Keyword? The amount to bid on a keyword depends on a comfort level when starting out. Industry is the biggest factor in deciding how much that click (lead) is worth. Real Estate or even a Moving Company, for examples, will usually pay a hefty price for a click because when that lead converts profit can be large. Best to stay within that comfort zone and then, as the data rolls in, adjust. Quickly we will see where the performing keywords at a particular bid price ARE, ARE NOT and THEN HOW TO BEST ADJUST BIDS accordingly. Carefully consider a maximum bid per keyword from the start. If we sell hats and make $100 per hat sold, and website history tells us 1 in 10 visitors buy THEN a *maximum bid* > EQUALS the break even point < would be $10. We, of course, want to set max’ bids far below ‘break even’ . That is, assuming, we want make money. There are several tools out there to help us find the right keywords and estimated cost per click for each. Arguably, the most effective choice is the Google Adwords Keyword Planner. And good news, it’s a free solution! Enter a keyword (=phrase) and it offers related keyword suggestions, historical data on how the keywords perform, suggested bid prices and it also helps to gauge competition. Given the list it can help us develop, the tool allows us to generally determine what keywords are worth chasing or bidding. Beating a dead horse here (maybe), but the choice of keywords is the most crucial factor in the success of a PPC campaign. Industry type and location are obvious when developing the right set of keywords (= key phrases) to bid upon. Like it or not, cost is going to be driven by competitive forces. The higher the cost of a product or service the higher (likely) cost of the keyword bid needed to be visible for a click. And the bidders / bid prices will change day to day. We need to find the keywords that are most likely to result in clicks and conversions, including AT OR BELOW our maximum bid price per keyword. Keyword choice (including bid, and bid too low = less exposure) is what will get our brand & service in front of consumers with intent … at the right time! What Is Our Geographical PPC Target? For the local business, a first PPC advertising campaign is not the time to target new areas. If we do our business in NY, consider a start with NY (if not the town or county in NY) modified searches. For local businesses who only deal in a certain geographical areas, like home inspectors for example who have to factor travel into their costs, it is easier to target geographically. Even so, you may want to start with one town or county and build up from there. There are tools available that will limit who sees the ads, based upon their location. Unless they search based upon our targeted area (NY), for instance a person in SC who searches ‘Orange County NY Real Estate Agent’, they won’t see the ads and waste click money. Again: test, measure and patience are required! It’s also important to prioritize GOALS! What do we want to get out of this campaign? Is it more leads? Sales? Traffic? Email subscribers? Let’s look at these, and a few more factors that will play a part in each unique businesses budget strategy. How Do We Do It: How Many Clicks Should We Budget For? While hypothetical, we need to start somewhere and here’s a method that will help. Understanding not every business owner will have all the numbers, everything can be estimated. Keywords: Let’s say that (using our research tool) we choose 100 keywords that combined have a projected search volume of 400 per day, locally. Let’s say the estimated average cost per click for these keywords is $4. Potential Searches: Multiply that volume (=400) by 30 days (= avg. month) and we have 12,000 potential searches in the coming month. Click Reality/Potential Clicks: There are people out there who, no matter what, will NOT click ads. It’s reality so rule them out! Let’s be realistic and say 1/3 of the 12,000 searches will consider Ads. That leaves us 4,000 searches or potential clicks. Estimated Actual Clicks: Let’s say 10% of these people will click our ads when searching. That’s 400 clicks to budget for in that 30 day period (10% X 4,000). Estimated Cost Of Click Budget: If we have determined the average cost per click is $4, than our cost for the month is going to be $1,600 (400X$4). Added Costs/Total Budgeted Cost: Unless managing the daily bidding marketplace and all it’s variables is possible alone, let’s add about $250 in management fees (per campaign) bringing monthly projected cost budget to $1,850. We may factor in creative, but the search network is text- based and a need for ads or landing pages will vary greatly from business to business. What’s more (depending), it may be a one time or a very infrequent cost… so let’s leave it at $1,850. Still hypothetical, projecting a sales GOAL will also help us to compare where we want to be versus actual results at the end of the month so that we can adjust month over month accordingly. Historical Estimates: Let’s say that historically the percentage of leads that convert from a website (or a website landing page) visit into a sale is 10%. Let’s say the average revenue generated per sale is $200. Estimated PPC Gross Revs: 10% close rate (x) 400 clicks (x) $200 avg. revenue per sale = $8,000.00. Targeted PPC Profit: Subtract monthly costs of $1,850 from $8,000.00 and there’s profit of $6,150.00 per month. Summarized: Less any creative costs, $6,150 may be worth doing … and if so, it’s here we begin! Return On Investment (ROI), or for our purposes Return On Ad Spend (ROAS), is another useful metric: Using this example it would be calculated by the standard formula (Profit – Cost)/Cost = ROAS OR $6,150-$1,850/ $1,850 = 2.3 OR 230% … which is certainly worth doing! We can also set a daily PPC budget, to further control overall cost. Just note that it will influence how often we have ads in front of the qualified searching people each day. Our bid per keyword will, of course, play a huge roll in the specific position our ads get (top to bottom) relative to the competition. By looking at daily data, including specific ‘per keyword’ data, we will see a pattern develop and recognize what keywords perform best and when. With PPC there’s daily management, as each day and time can have it’s own market of bidders. With limited space and high competition, the daily bid price we need to succeed is going to move. With Facebook advertising, we can set a budget and pay based on impressions. Or, we can pay per click. On Facebook, just like with Google or Bing, being strategic with bidding can make or break the campaign. Once we have worked through the creative part of designing a Facebook ad, we will receive a suggested bid range from Facebook. When just starting out with Facebook ads we may want to stick to the low end of this range. Once we cans see what the click through rate actually is, we can then adjust bids. For example if we have a very low click through rate then we will need to bid higher. If we have a high click through rate then we can probably back down the amount on bidding. Each day, week, or month we can look at data and optimize from there. We may also need to adjust bids to reach more of the target audience. We can have a high performing ad, but still not reach the amount of the target audience we’d like. Facebook provides detailed real time analytics to help in this process. We can certainly help. Our NJ Facebook Advertising Programs are designed with unique goals in mind. There are tons of constantly changing, fluid pieces to the puzzle of PPC advertising. It is time consuming, and at times can be overwhelming. As a business owner you do not need to tackle this yourself. Hire a trusted company to handle the leg work for you. At Kinetic Knowledge we work with you to determine your goals and find your PPC advertising sweet spot. Check out our NJ Pay Per Click Advertising Programs. https://www.kineticknowledge.com/wp-content/uploads/2015/08/kinetic-knowledge-logo2.png 304 300 Kinetic Knowledge https://www.kineticknowledge.com/wp-content/uploads/2018/08/KKLogoDarker-1.png Kinetic Knowledge2015-10-09 16:07:252015-10-16 20:46:07How To Determine A PPC Advertising Budget? Google Making Changes To Its Local Search Results Facebook Ads Are Cheap!